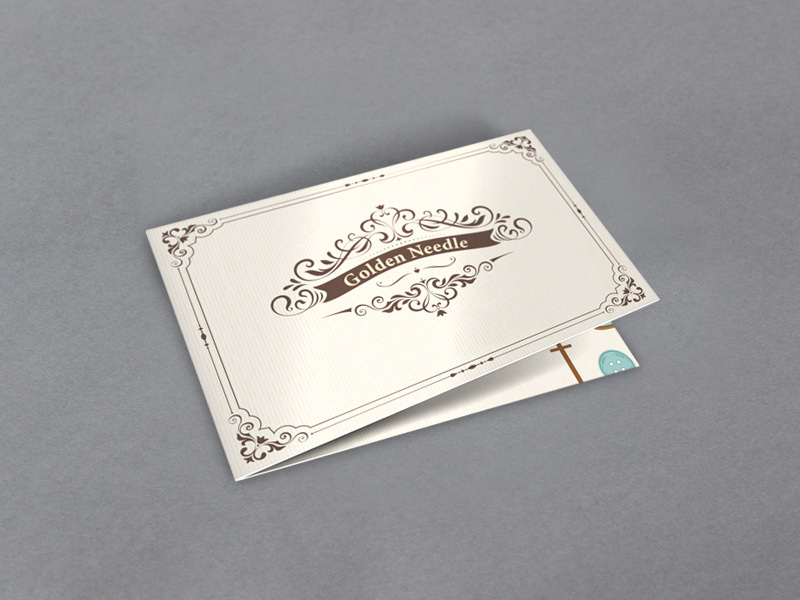 Business cards are small-format advertising and as such deserve to be done well. We produce and supply them loose or bundled. In folding versions, as loyalty or bonus cards, printed on one or both sides. We have the papers and inks it takes to impress and win customers. The ideal format for anyone who wants to say more. 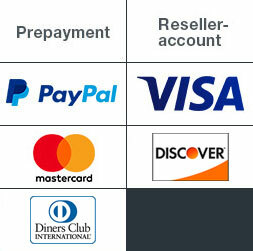 They give you a total of four panels for adding address data, extra information or even pictures – for example, in a practical credit card format of 55 x 85mm or 50 x 90mm. We take something good and just do it twice as well. How does that work? Fold it down! 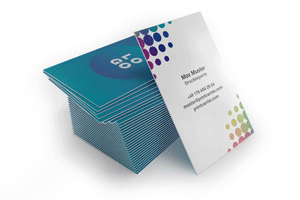 Our folded business cards offer more space and add more attention to your business information. In addition, this dainty format also holds the potential for many other applications. 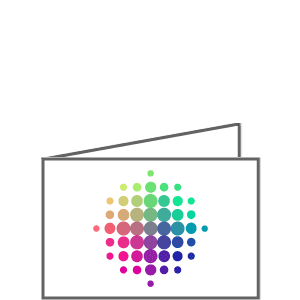 Folded business cards are available in the two standard sizes, both portrait and landscape. 8,5 x 5,5 cm or 5,5 x 8,5 cm. 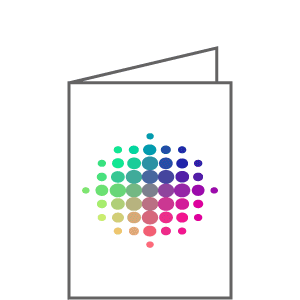 We print your individual content on the card four coloured. For maximum colour effect in small format. For your personal favourite, we offer you 3 grammages to choose from. 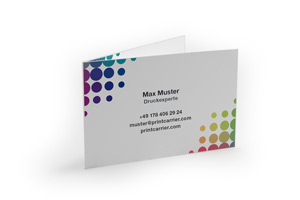 By the way, when printing your folded business cards, we rely exclusively on noble papers "Made in Germany". Twice as much impression. You can use the layout skillfully to make your contact details on the front page with a cleverly chosen phrase or picture to arouse curiosity. Double the space. You have always been annoyed that this one important piece of information never had a place on your classic business card. 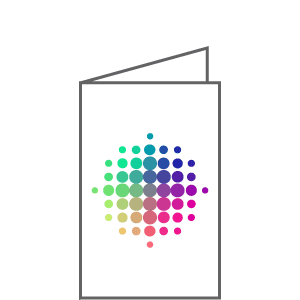 With the fold you can communicate more broadly. Twice as original. In the age of Xing and LinkedIn, even a normal business card is a nice and positive change. How pleasant do you think the foldable version will be? Just be a ticker more original than the competition. and everything else you can think of! 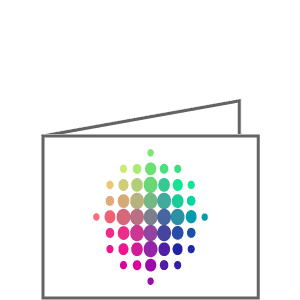 Your folded business cards leave our print shop in parcels of 250 to 20,000 pieces and will arrive the next day after 4 days for standard shipping, 2 days for express shipping and the next day for SameDay. Not only business cards - whether foldable or not - you can receive just any of our print products free of shipping costs from us.